* Towering striker Henry Osita (195 centimeters) has joined Norwegian top level side Viking FK. As Osita has struggled for playing time at both Rangers International FC and Sunshine Stars FC, I am a bit surprised by this transfer. According to the official homepage of Viking FK, Osita has scored “24 goals in 52 matches during the last three seasons”. This is also a surprise to me. Osita, also known as “Henry Chikere Osita”, has not scored for Sunshine Stars FC during the on-going GLO Premier League 2013. Last season, Osita scored one goal for Wikki Tourists FC and no goals for Rangers International FC, which he joined during the mid-season transfer window. I am not sure where Osita played during the 2010-2011 or 2009-2010 season, but he did certainly not score any goals at top level of Nigerian football. * I have followed Nigerian football for quite some time and I can not remember that a player has ever featured for three different Premier League clubs during one single season. This is actually the case with the dependable centre-back Seun Sogbeso (born 02.06.1989). Sogbeso started the season at Kwara United FC, joined Sharks FC in May, and has now signed for ABS FC. * Chizoba Amaefule (born 28.10.1994) has finally made his league debut for Dolphins FC. The talented centre-back, who played one match for the Nigeria U-20 national football team during the current FIFA U-20 World Cup in Turkey, started against Akwa United FC on 07.07.2013. Amaefule is a former player of city rivals Sharks FC and second-level side Remo Stars FC. The picture is of Amaefule and was found on MTN Football. * Christian Pyagbara (born 13.03.1996), who made one substitute appearance for Nigeria U-20 during the FIFA U-20 World Cup in Turkey, also made his league debut on 07.07.2013, starting for Sharks FC against Warri Wolves FC. Pyagbara is primarily a right-winger or striker. I have always questioned how players without league experience is picked for the Nigeria U-20 national football team. There are so many young, talented players in Nigerian football. Why choose players who lacks experience from first-team football in the two professional leagues in Nigeria? Pyagbara is a talented player but largely inexperienced. First-choice goalkeeper Samuel Okani (born 11.02.1994), who had a poor match against Uruguay on 02.07.2013, is apparently miles away from the first-team of Enyimba FC, where Godwin Paul (born 16.09.1987) and Olufemi Thomas (born 05.08.1989) are preferred. There are several examples if you look at the various Nigeria u-20 squads from the last couple of years. * Daniel Essien Etor (born 05.05.1992) has left Akwa United FC and joined Enyimba FC. Etor, a left-winger / attacking midfielder, is a gifted player with pace and skill, known for his dribbling runs and mobility. Etor made his debut for the Peoples Elephant on 07.07.2013 against Rangers International FC. * With the experienced Oliver Agbo, Gombe United FC could have made a smart signing. The tall, powerful striker, who scored four goals for Jigawa Golden Stars FC during the Nigeria Premier League 2012, has scored in the last two matches. Gombe United FC has also re-signed central defender Demero Efeowie, who played four matches for Dolphins FC in March and April. Talented midfielder Ibrahim Chilli scored his first league goal on 07.07.2013 against Shooting Stars FC. * It can now be confirmed that Musanpa Okiki, the top scorer of Nembe City FC with five goals, has joined Kano Pillars FC. The strongman will be a major loss for Nembe City FC. * Defensive midfielder Baba Idris of Nasarawa United FC is a player that deserves attention. The team captain has tremendous strenght and is a consistent, hard-working player. Last season, Idris was one of the key performers when Nasarawa United FC won promotion. * Watch out for youngster Kelvin Itoya at Warri Wolves FC. Itoya, a striker, scored his first top level goal against Sharks FC on 07.07.2013. Itoya was discovered at amateur club Lisborn Football Academy. * After a horrible start to the season, Sharks FC has looked somewhat better recently. Personally, I think it is because the club has signed an almost new starting eleven, including a couple of quality players. The players include left-back Adeyinka Michael Adedeji (born 25.03.1985), formerly of Shooting Stars FC and FC Pyunik (Armenia), right-back Brown Braye, formerly of Nembe City FC, striker Tayo Fabiyi, formerly of Kwara United FC and Rangers International FC, attacking midfielder Nasiru Hussaini, formerly of Kaduna United FC, goalkeeper Danladi Issah, formerly of Heartland FC, right-winger Anthony Okemmiri, formerly of Kwara United FC and striker Chibuzor Osigwe, formerly of Niger Tornadoes FC. The rather unknown Nathaniel Joseph and Stephen Erewa have also done well, and I’m currently trying to find more information about these players. * The current top scorer in the GLO Premier League 2013 is burly striker Dele Olorundare (born 01.12.1990) of Sunshine Stars FC with 11 goals. From my point of view, the clinical finisher is the most interesting striker in the local football of Nigeria. 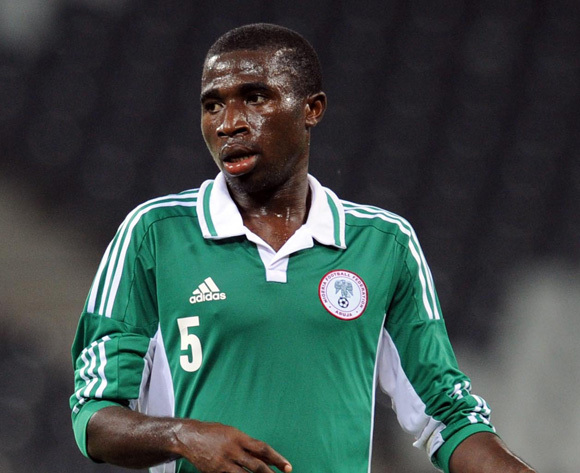 Attacking midfielder Oghenekaro Etebo (born 09.11.1995), the prodigy at Warri Wolves FC has scored nine goals. Isah Akor (born 01.11.1991) of Heartland FC and Bishop Onyeudo of Gombe United FC have both scored eight goals. Please note that Onyeudo is about to register for Enyimba FC. * Unfortunately, it is almost impossible to find information about the current matches of El-Kanemi Warriors FC. I would be grateful if any of my readers could inform me about the scorers from the matches El-Kanemi Warriors FC vs. Kano Pillars FC on 03.07.2013 (2-0) and El-Kanemi Warriors FC vs. Nasarawa United FC on 07.07.2013 (3-0). I would also recommend the following excellent article, describing the unfortunate situation in Maiduguri: http://www.naijafootball247.com/2013/06/playing-football-with-terrorists.html.